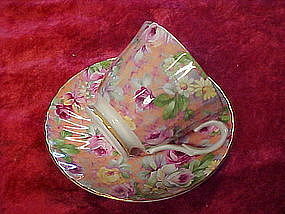 Demitasse Teacup & Saucer Set made by INARCO Japan. 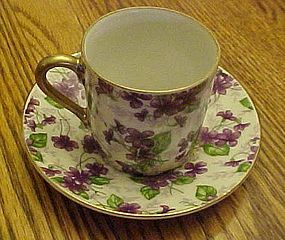 Violet Chintz pattern. The saucer is 4-1/4" in diameter. 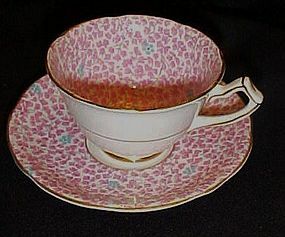 The tea cup is 2-1/8" high. Excellent cindition, no cracks, chips or crazing. Original sticker. 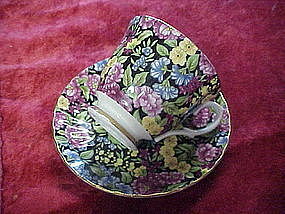 Amazing vintage bone china cup and saucer made by Gladstone England. Teeny pink flowers with a sparse sprinkle of a tiny blue flower ever so often. Gold trim on edges, and handles and rings. Pristine condition. 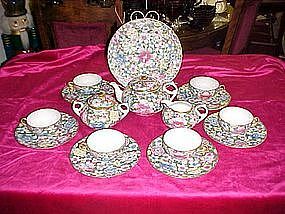 a pretty set for you chintz collection. This set is from an estate so is most likely 40's-50's era. 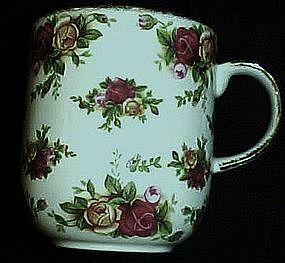 Beautiful Royal Albert bone china mug measures 3 3/4" tall and is in the classic Old Country Roses Pattern. Gold trim on the rim and handle. Pristine like new condititon. I have 2 available, and price is per cup. I will be listing the matching teapot soon. 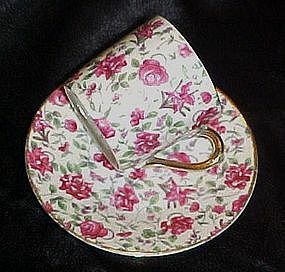 Pretty little vintage demi cup and saucer set with an all over rose chintz pattern. Gold trim. Wreath mark Made in Japan. Both pieces are in perfect condition with no damages. Saucer is 4 1/4" in diameter. This nice large trinket box is perfect to keep those special keepsake items in. All over chintz pattern, with gold tone hardware. Closes nicely. Measures 4 1/4" tall and is in perfect condition. Bottom stamp says Bloom Rite. 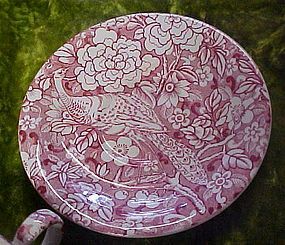 Very pretty for the bedroom or bath. Maybe even to use as a tea holder. 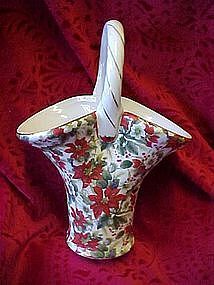 Single creamer measures 2 3/4" to the tip of the spout. 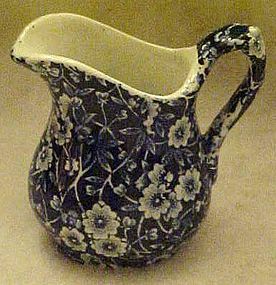 Swirl shape with a pretty floral chintz pattern and gold accent trim on the edges and handle.No chips or cracks, just perfect. No makers mark or stickers. 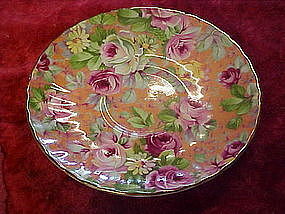 Pretty collectors chintz plate marked James Kent Collectors chintz England, Plate measures 5 3/4" in diameter and has gold trim. 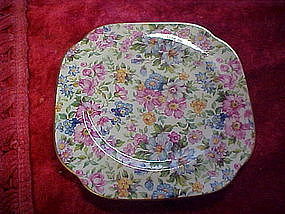 An explosion of delicate wildflowers cover the entire plate. Perfect condition. Email me if you need to seee a pic of the back stamp. 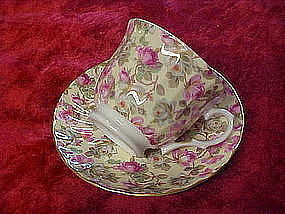 Gorgeous bone china cup and saucer set made in Staffordshire England. 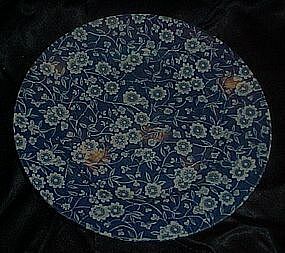 A profuse amount of bright flowers on a black background with gold edge trim on both pieces. Pristine condition. Very lovely. 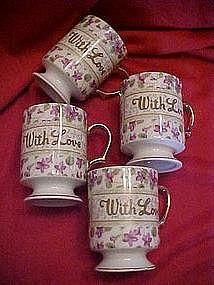 This is a wonderful set of china coffee mugs with a chintz pattern of violets all around the mugs. On the front are the framed words "With Love. Lavish gold trim on handles and on cup edges. Each cup measures almost 4" tall and has a pedistal foot. No stickers or makers marks but they are very nice. A nice useable size too! All are in perfect condition. If you love violets you will have to have these. I haven't got a clue as to the age. They appear to not have been used much, if at all. Just in time for the holidays!! 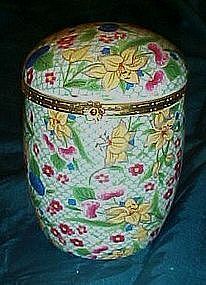 A pretty chintz basket with pointsentia florals. Measures 9" tall, has pretty gold trims. Made by formalities, Baum Bros. Excellent condition. Would make a lovely gift basket filled with goodies to give to a special friend. Pretty victorian roses chintz teapot. 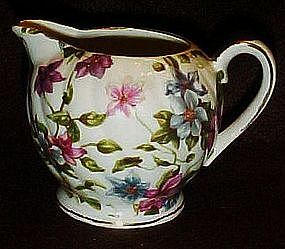 Made by Formalities, Baum Bros. Has all over chintz rose pattern. Rosebud finial on the lid and gold trimmings. Measures 7" tall and is in PERFECT condition! I'm pretty sure this is not an old one, but it is gorgeous and well made. What a beautiful gift it would make for that special person on your gift list.